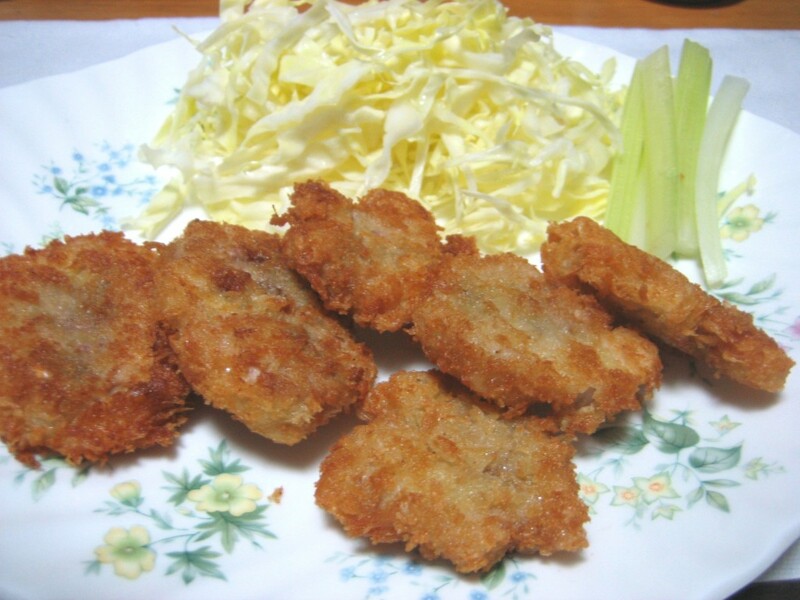 It is said that the root of ”Tonkatsu” is cutlet and I also think so. 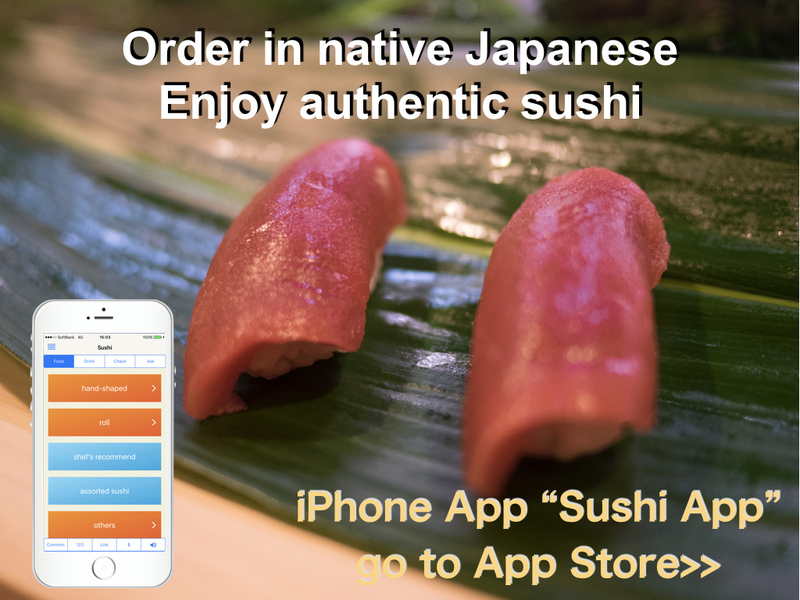 So it can be categorized as a yoshoku, but I heard that it is served in foreign countries as Japanese food. “Ton” means pork and “Katsu” is from cutlet. 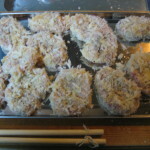 It is also used for Katsudon which I introduced before. 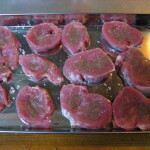 1) Cut pork about 1 to 1.5 cm thickness. Dash sea salt and pepper. 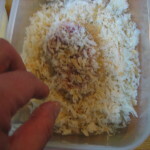 2) Coating pork with flour, put it in egg then coating with panko. 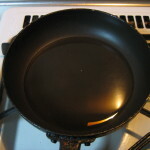 3) Put cooking oil in a fry pan and heat it on about 170 degree(C). 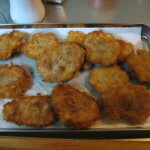 Put 2) in a fry pan and fry it well until it becomes golden brown. Normally, it is cooked with a lot of oils. 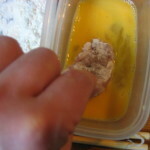 So it is also called “deep fry.” To save oils, I don’t use a lot of oils at this time. But it is OK if you sometimes turn over pork. We usually eat it with Tonkatsu sauce and mustard. Tonkatsu sauce is this. It is like worcestershire saucehas and has more consistency. At this time, I cooked pork tenderloin. 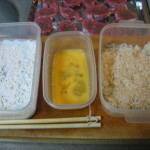 In Japan, loin tonkatsu is also popular. I like tenderloin because it is more tender. Also my favorite is dash more pepper. This food was developed in Meiji period (1868 – 1912). In 1899, a restaurant on Ginza, Tokyo seems to be first one serving Tonkatsu. 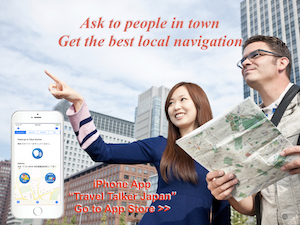 Now there are many Tonkatsu restaurants in Japan and they are usually reasonable. 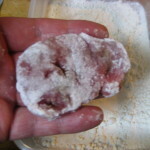 Also it is a popular home cooking foods.